Are you ready to rock some Ryvita? I go through cycles of eating Ryvita Crispbreads. I eat them for a while at work, then I turn back to sandwiches. I tend to eat them more often when I'm trying to eat lighter or I'm back on the 5:2 diet, but I only realised when Ryvita challenged me, how poorly I've been treating them. So what have I been dressing my Ryvita in? Half a light Laughing Cow triangle. Yes, you may well laugh! In my defence it's low calorie, but I forgot that salad and vegetables can be light toppings too and way more interesting. Ryvita used to be a pretty standard crispbread too, but just look at all the flavours you can choose from now! You may not realise that rye is the main ingredient in Ryvita cripsbreads and that rye is packed with nutritional benefits. The crispbreads simply made with water, salt and rye, then extra goodies like seeds are added. So are you ready to see how my week of Ryvita looks? No more Laughing Cow! 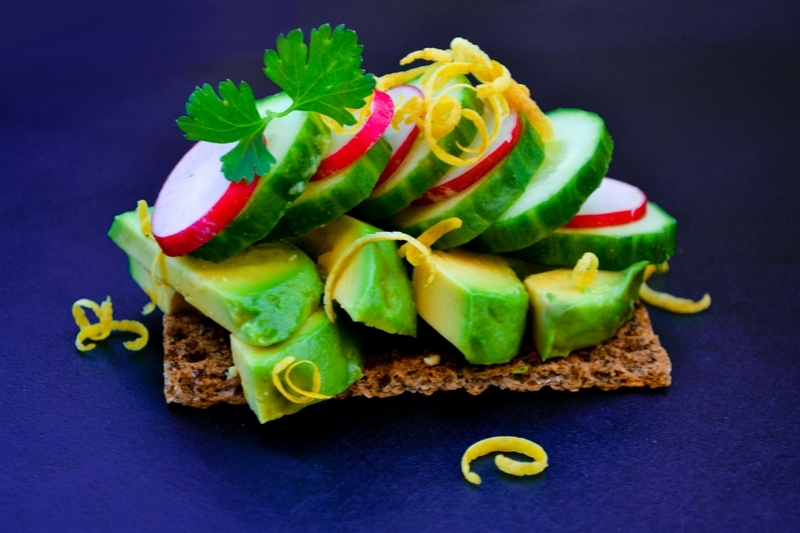 A Sweet Onion Ryvita Crispbread, topped with slices of creamy, ripe avocado, tossed in a little lemon juice so they don't discolour. Topped with slices of radish and cucumber for crunch and finished with some finely grated lemon peel for a little kick of citrus. Heavenly healthy! 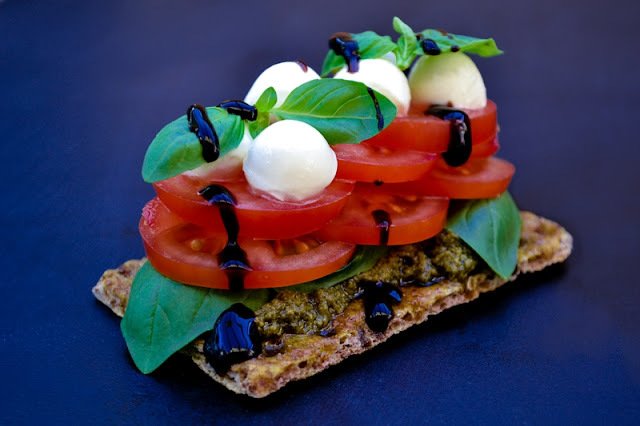 A dark rye crispbread topped with dairy free pesto, fresh basil, two layers of ripe red tomato slices, milky baby mozzarella balls, more fresh basil and a drizzle of balsamic glaze for that Italian classic, Caprese Salad. 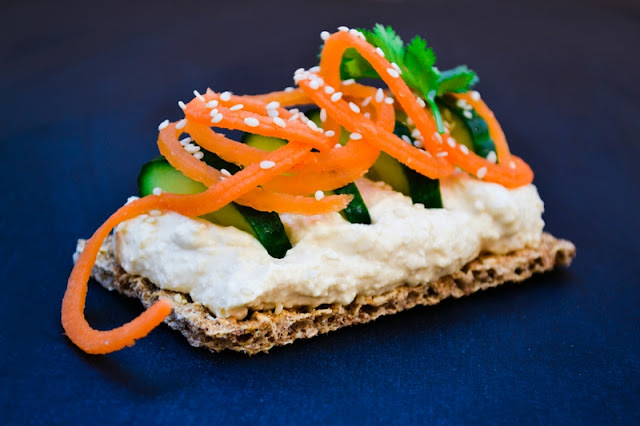 A slice of sesame crispbread, heaped high with hummus, topped with slices of crunchy cucumber, spiralzsed carrot (if you don't have a spiralizer, Tesco sell tubs of spiralized vegetables) and finished with a sprinkle of sesame seeds to echo the flavour of the crispbread. Simple, but a delight. This one was amazingly flavourful. 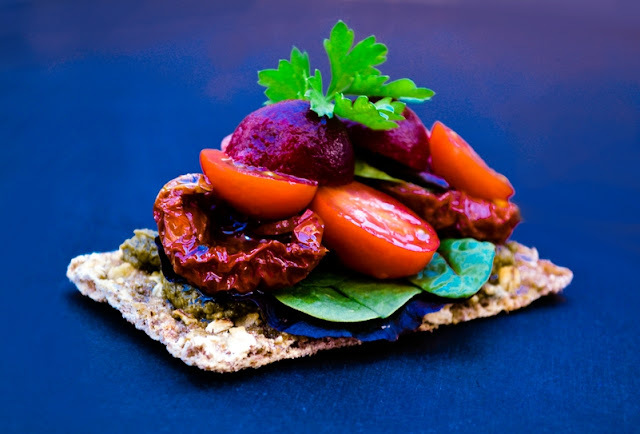 A pumpkin seed and oat crispbread topped with dairy free pesto, salad leaves, sundried tomatoes, ripe baby plum tomatoes and baby pickled beets. My mouth is watering just remembering this one. We had to finish on a high with something a bit naughty. Friday is the beginning of the weekend after all. This one is luxurious, but still includes one of your five-a-day. 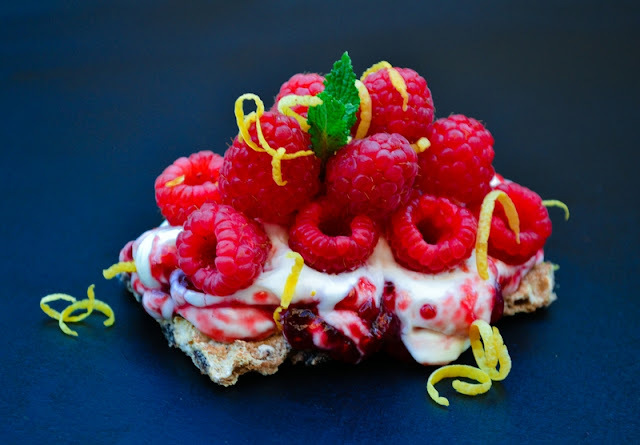 A currant, seed and oat crispbread topped with Philadelphia cream cheese mixed with a little icing sugar and lemon juice and a dollop of soft set raspberry jam swirled through, then topped with fresh tart raspberries and finely grated lemon peel. You'll do a Meg Ryan and moan out loud when you bite into this one and everyone will want what you are having! So do you think you can come up with your own crispbread creation? for the chance to create the ultimate lunch. 10 runners up will receive a hamper full of Ryvita goodies. Just head to the website and enter your details for a chance to win. media with the hashtag #MyVita. I can't wait to see your creations! Disclosure: This is a sponsored post for Ryvita. I was not expected to write a positive review and any opinions expressed are my own. I know, it's easy to do that, but only takes minutes to create something a bit more special. I like wednesday's option with the hummus. I really like ryvitas but find them a bit dry so like to have something moist with them. Yes they are crisp and need nice toppings, although I quite like them plain with soup. 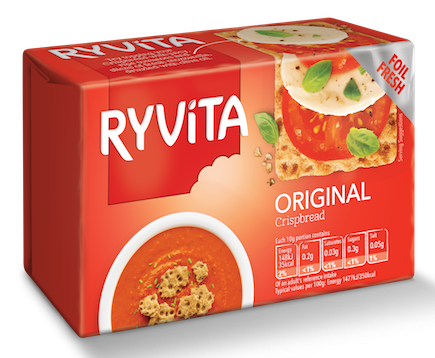 How funny that you're on a Ryvita trend right now, too. This is what I tend to eat when the weather warms up and I want something healthy but not terribly filling. We are big on smoked cheese and avocado toppings as well as a curried (seitan) "chicken" salad with chopped apples and currants. VERY tasty. I just found the fruit-and-rye options here, and those are an eye-opener! I usually just have the plain rye or the sourdough! I find them really handy for work lunches and I like the crunch. Fab inspiration here! Especially loving Friday's one. I don't think I've ever put a topping on any of their sweet variants. I'm going to have to keep an eye out for the Apple & Cinnamon ones as haven't come across them and they sound right up my street. Oh you must try a dessert topping, it's amazing. 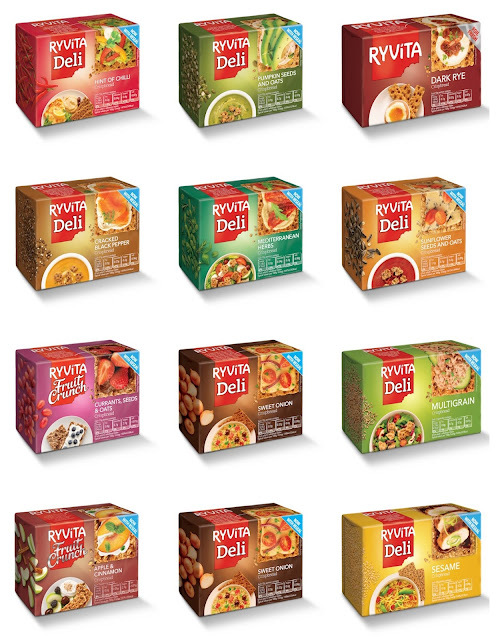 Wow, very impressed with your inventive ideas for lunches based on the different flavour ryvitas! Thanks Kavey, it was fun to come up with new ideas and even nicer to eat them. Wow these look fantastic Jac! I'm particularly loving Tuesday and Friday's ideas! I've just bought a packet of my fave Dark Rye Ryvita to get me through the week in a vaguely healthy manner, so shall be giving some of these ideas a try! Thanks and yes stack them up Katie! I don't think I've seen the full range, but I do love the mutligrain and the fruit crunch one. I'll have to try your "Meg Ryan" one with the raspberries. Sounds lush! Oh yes the raspberry one was awesome!